This is another activity I must give credit to my mother in law. She was babysitting one day while I was working. When I came home, B kept handing me his giraffe that is a musical wind up toy. I quickly realized he wanted me to hide it.....GENIUS! She had been using it to play hide and seek with him. 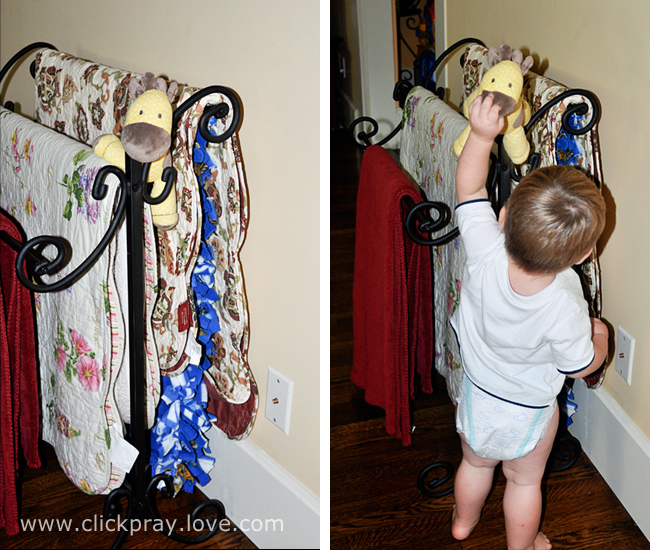 Musical Hide and Go Seek is excellent for young children who have yet to understand the concept of hiding, then seeking, due to their short attention span. You will need one stuffed wind up musical toy or any musical toy for that matter. You may have to help him/her the first few times, but it won't take long before they will begin listening, seeking, and finding. Tip # 7: Pay attention to the characters in the books you read to your children, then look at his/her toys. Do you have any toys that go along with the characters? If so, show them to your child while reading the story. For example, we have several plastic farm animals that we use while reading Big Red Barn . Pre-Toddler Activity #5: What to do with Play-Doh? Pre-Toddler Activity #9: Shape Sorting....with a TWIST! Very Cute Pictures & great ideas! 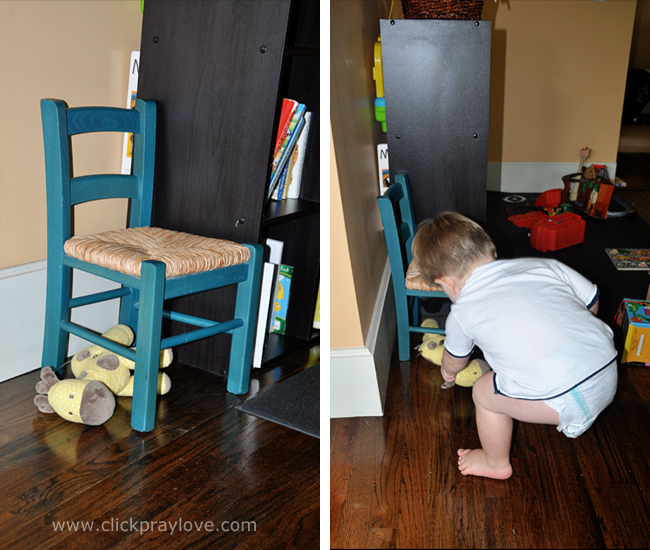 i don't have toddlers around the house anymore, but what a cute idea and especially love B in these pics! Amber, you are a genius! And I heart this new site – so pretty. And that boy! I stick to what I said a long time ago – keep feeding him – encourage them to tackle your hubs as often as possible – and he will one day buy his mama a beachside house with his gigantic NFL contract. I just know it. God bless you Amber. What a great idea! Hunter would love this. We will try this tomorrow. :] I see B runs around your house like Hunter runs around ours... in a shirt and diaper. Thanks for sharing! What a terrific idea. I'm going to have to try this. Love it!! Great idea, will have to try this with Jack. Very cute activity! My toddler will love it! Thanks for linking up to Living Life Intentionally Linky Party!